Pre-heat the oven to GM5/190c. Trim the aubergines and cut lengthways into 1cm slices and lightly brush each side with olive oil. Place onto a baking tray and bake for about 20minutes until tender turning once then set to one side to cool. Heat a little olive oil in a pan and sweat the onions for 3-4minutes until soft but not brown. Add the garlic, tomato puree, tomatoes and a little pepper. Cover and cook on a low heat for about 10minutes. Uncover the pan and continue to cook for about 15minutes stirring occasionally until the sauce thickens. Cover the bottom of an oven proof dish with ½ the sauce. Put a dollop of ricotta cheese onto a slice of aubergine and then roll it up. Place on top of the sauce and then repeat until the dish is full. 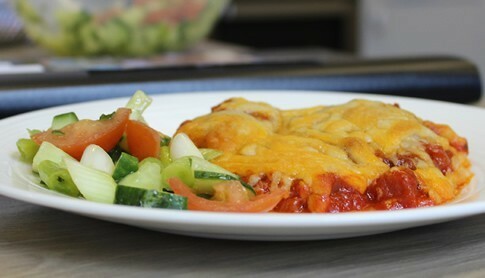 Cover the aubergine rolls with the other ½ of the sauce and the top with grated cheese. Bake in the oven for 10-15 minutes until cheese is golden.